Holland America's newest and larget ship set for delivery in 2016. 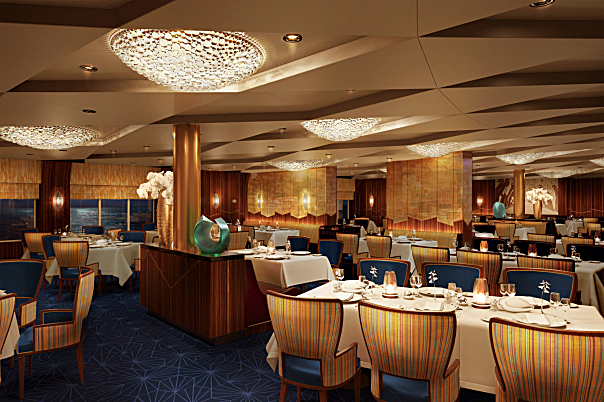 The Culinary Arts Center onboard the ms Koningsdam is presented by Food & Wine® magazine and is a dedicated shipboard setting with a dramatic show kitchen and individual cooking stations that will be used exclusively for activities such as cooking demonstrations and hands-on classes by visiting celebrity chefs and the ship’s own experts. Regionally inspired workshops, as well as kids’ and teens’ cooking classes, also will be featured. Large mirrors, viewing screens and an open kitchen make it possible for everyone to watch the food preparation and learn from the comfort of their table. This tranquil contemporary spa is a haven of luxurious beauty salon and spa treatments, featuring thermal pools, heated ceramic lounges and treatment rooms facing the sea. Relax in the comfortable coffeehouse atmosphere of Explorations Café featuring the daily crossword puzzle, custom espresso drinks and pastries, and a comprehensive selection of books and travel guides. Learn new technical skills taught by Microsoft-trained techsperts. The professionally-staffed Fitness Center is equipped with the latest cardio and weight machines and features fitness classes in yoga, Pilates and more. Two refreshing outdoor pools also await, along with a jogging track and sport court on deck 11. Club HAL® provides a wide variety of exciting youth and teen-friendly activities for guests ages 3 to 17, supervised by full-time staff with degrees in education, recreation, childhood development or related fields. Enjoy a wide variety of duty-free shopping in the Signature Shops. A luxury jewelry boutique featuring high-end watches and pieces from noted designers. 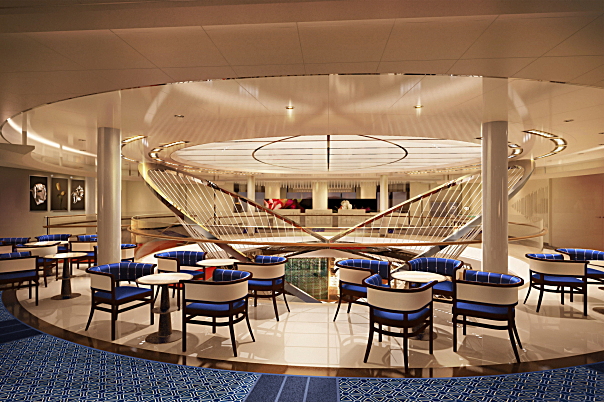 Promenade deck encircles the ship, offering spectacular views in every direction—the perfect place for a brisk run, an after-dinner stroll or simply relaxing in the sun on a classic teak lounge chair. 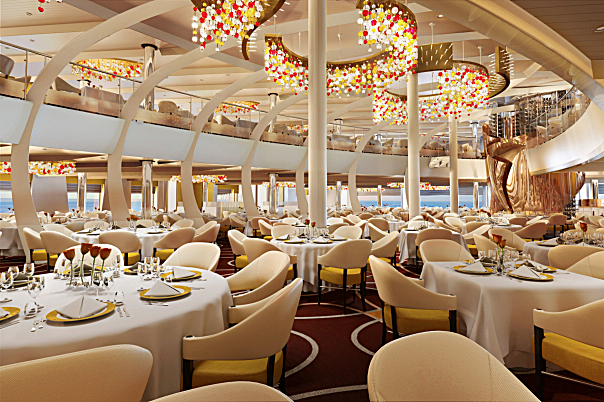 The main Dining Room aboard ms Koningsdam will span two floors and be framed by views of the sea. A bright interior will be inspired by a modern, global design and sets the stage for the exceptional culinary experience to come. Strong, curved architectural pillars will accentuate the soaring ceiling. 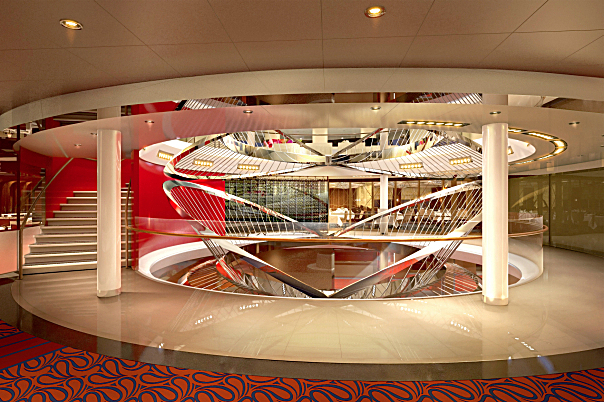 Chic, custom furnishings and modern glass lighting are being fabricated especially for the ship. 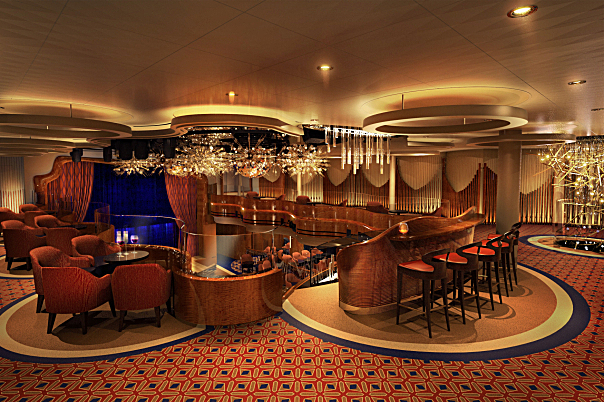 The centerpiece is a curved copper sheath surrounding a two-story wine tower showcasing an impressive selection. This intimate, award-winning restaurant features choice Pacific Northwest cuts of beef and other traditional steakhouse favorites, beautifully complemented by boutique wines from the Pacific Northwest. Tamarind's exotic menus evoking the culinary traditions of Southeast Asia, China and Japan, including a newly added sushi bar.